Even though experts assure this structure is a fallstreak hole, conspiracy theorists strongly assure that it is an alien UFO from deep space. A few days back, several photos and videos apparently taken from the United Arab Emirates (UAE) surfaced online, and these images featured a strange circular structure in the skies. Most of the users who posted the video on Twitter and Facebook argued that a hole had opened up in the sky, while some others alleged that weather control manipulation is going on. However, after analyzing the videos and photos, popular conspiracy theorist and extraterrestrial researcher Scott C Waring proposed a bizarre theory that may seem too tough for the human conscience to digest. As per Waring, the gigantic circular hole-like shape spotted in the skies of UAE could be a cloaked alien UFO. The self-proclaimed researcher argued that aliens have visited the Arab country because of its rich oil and wealth. "That's easy to answer, its a clocked alien craft. They are over the UAE to observe one of the richest countries in the world for their oil and wealth. If you look closely at the hole, you will see an inner and outer ring. This means the UFO is still there right now as this photo was taken. That's right, it hasn't flown away, it is still there. Did you also notice that the centre of the circle has a pushed down lower area of clouds? Because the ships lower part shoved the clouds out of the way to make room for the UFO," wrote Waring on his website UFO Sightings Daily. Waring also alleged that these UFO sightings should be investigated seriously as it is a matter of public privacy. "They are watching, recording and gathering more data on you than you knew existed. All without your permission to do so. That is a crime that has continued for thousands of years on Earth and still does. I call that a crime against humanity," added Waring. 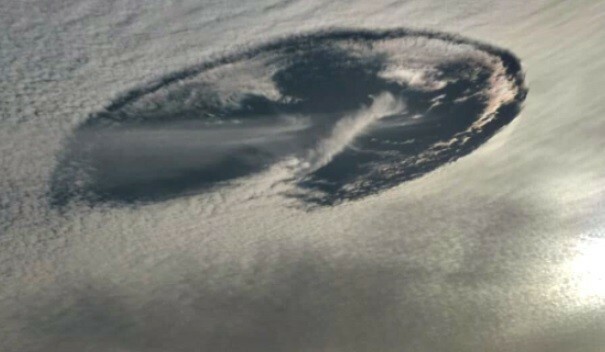 However, experts who analyzed the UFO images and videos quickly dismissed the alien angle, and they made it clear that the structure appeared in UAE skies is nothing but Fallstreak hole popularly known as hole punch cloud. Weather experts revealed that this is a purely natural phenomenon, and it usually happens when the water temperature in the clouds below get frozen, but the water, in a supercooled state, has not frozen yet due to the lack of ice nucleation.